September 27 (Saturday, 1-4 p.m.) The Oberlin Heritage Center will be one of many local groups participating in the Oberlin Community and Culture Festival - stop by and say hello at OHC's booth on Tappan Square. The Festival celebrates diversity, creativity and commitment with a great mix of cultures, languages, food, music, dance, art, and more! 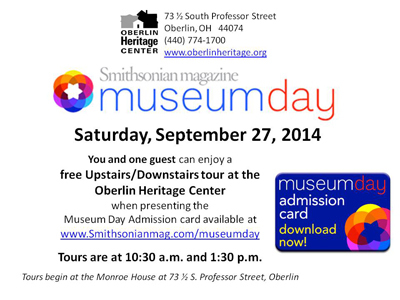 Enjoy a FREE Upstairs/Downstairs tour at the Oberlin Heritage Center at 10:30 a.m. and 1:30 p.m. as part of Smithsonian Magazine's 10th Annual Museum Day. Present the Museum Day Admission Card available at www.Smithsonianmag.com/museumday.